This post contains some affiliate links. This means that if you click through and decide to make a purchase, the price you pay stays the same but I may receive a small commission that goes back into keeping the blog running. Thanks for your support. They're cheap to make, you can play around with lots of flavours, and you can eat them hot or cold, at home, or on the go. 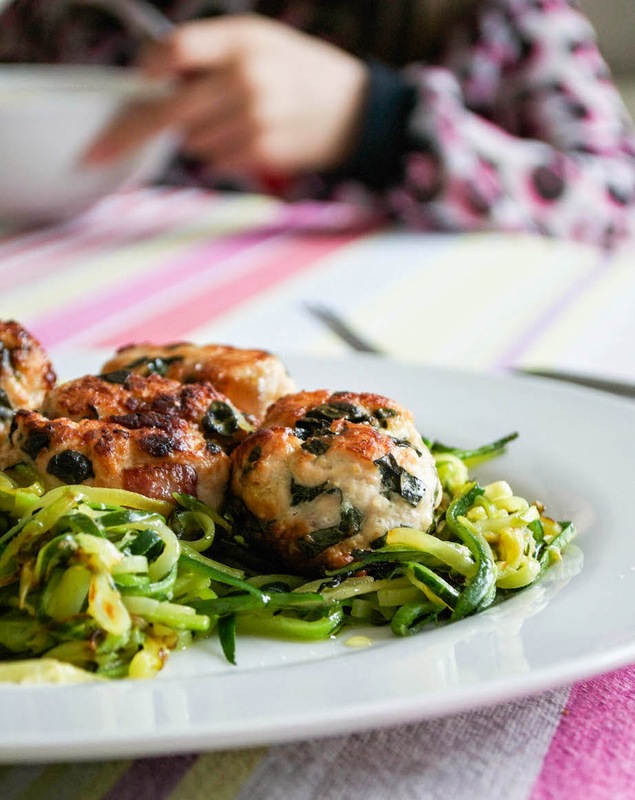 I got hold of a load of dark Cavolo Nero cabbage the other day, and I thought I'd serve them alongside some turkey meatballs that I was planning to make. Actually, I thought - scrap that, let's chop them up, stick them INSIDE the meatballs and tell the children that it's herbs. "What's this, Mum, in the meatballs?" "It's cabbage. It's called Cavolo Nero cabbage." And so that was it. I love the earthy flavour that the cabbage gives to the meatballs and you're getting an extra bit of veggie in there that you don't really expect. I also love the colour they give. The girls ate theirs with some tomato sauce and gluten-free pasta but we ate ours with fried courgette strips. First, empty the mince into a mixing bowl. Add the chopped garlic and the chopped Cavolo Nero leaves and the pinch of salt and mix well, but don't over-mix. Heat 1 tbsp oil in a largeish frying pan and, forming the mince mixture into small meatballs, drop them gently into the pan. You might need to do this in batches, if you have a smaller pan - don't overcrowd them or you might find that they steam cook rather than fry and turn golden. I brown the meatballs, turning them on all sides and cooking for around 5-10 minutes and then finish them off in the oven, at gas mark 6/200ºC/400ºF for another 10-15 minutes, until fully cooked through. This way, you've got the hob free for your veggies or side dishes that you're going to serve them with. 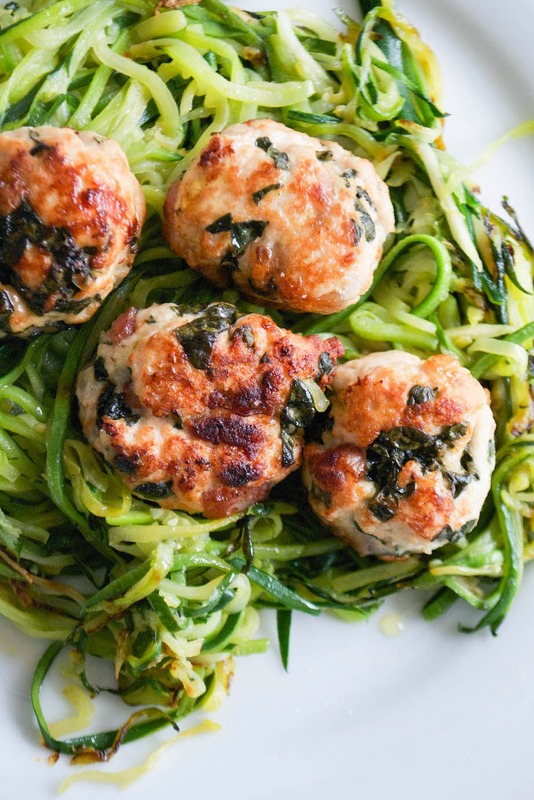 We love to serve them with spiralised courgette/zucchini. They're also lovely hot or cold - keep a batch in the fridge and take them out on a picnic now the weather's getting warmer. 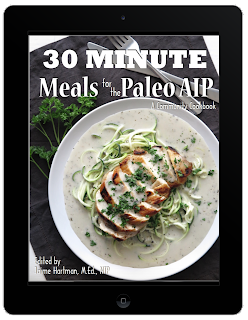 Also do have a look at my AIP Resources page for more AIP-compliant ebooks, programs, bloggers and books.